NVP Newsletter – Issue 03 Is Up! It is with great pleasure that we present to you all the 3rd Issue of NVP Newsletter! We have quite a lot to share, so sit back, relax with a hot mug of tea, follow the link given below and enjoy the read. How can we continue Edhi’s Mission? Our new blog is up! 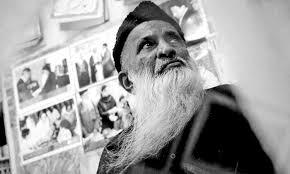 Simply follow the link to check it out: How can we continue Edhi’s Mission? Do read and comment when you the time! As National Volunteer Programme highlights the heroes of Pakistan, the first person who comes to mind is Abdul Sattar Edhi and his work through the Edhi Foundation! Abdul Sattar Edhi was the most endearing person in Pakistan, and the third Pakistani to receive military honor at his burial ceremony after Quaid-e-Azam Mohammad Ali Jinnah and General Zia-ul-Haq. Call him an Angel, Mother Teresa of Pakistan, Father Teresa, Angel of Mercy or ‘The Richest Poor Man’, call him by any name but the fact is that, he was just an ordinary human being without any mystical or divine powers. Edhi has always believed in simplicity, truth, piety and humanity. His life holds so many lessons for us. Now it’s time for us to continue and contribute to his Mission. Start with simpler tasks. Take care of orphans, widows and needy by any means. Donate them money, devote your time in educating or helping them, join any NGO as a volunteer or try providing them basic necessities. Start caring for humans beyond ethnicity, caste or religion. Look after animals around you. Our individual and collective efforts can create a big difference in the society. Let’s vow to continue Edhi Sahab’s mission by employing compassion in all our actions. Karim Moiz Sharif is a summer intern at the National Volunteer Programme. He is currently studying Bachelors of Business Administration (BBA) from Shaheed Zulfiqar Ali Bhutto University of Science and Technology, Karachi (SZABIST’K). Karim hopes to major in Marketing. He likes to read articles related to socio-economic situation of Pakistan. He also loves writing and keeping an eye on politics and social issues.